Wicked Awesome Adventure: 170 - Release the BEAST upon THOSE WHO HAVE ANNOYED YOU! Hmm. Maybe it would be best to check what you have rattling around in your memories, specifically from those memories that came from before you woke up in that room a few minutes back. You, CADUNGERY MUFFINBOTTOM III, incredibly handsome, rich, and awesome. None can compare to your staggering strength, intellect, speed or charisma. Women want you and men want to be you. In fact, you came up with that phrase at one point while being totally cool. Your friend ALAN. Almost as smart as you. You would trust him to the ENDS OF THE EARTH. Your... friend RHYS. He's like a SIDEKICK for you, really, always hanging out with you in order to leech off some of your total AWESOMENESS. Always wears a freaking SUIT for some reason. JET, or JILL ELYSIA THUNDERSON as you sometimes call her. She's been in love for you since forever, though she tries to hide it under a facade of sarcasm and a pretense of frequently ignoring you. Even went so far as to "date" RHYS to mask her true feelings for you. PIZZAPOLYLPSE. You despise this CHAIN OF PIZZA PARLORS, though you can't exactly remember why. The hatred smells ever so faintly of OREGANO, however. Unfortunately, that's all you have left in the haze of your MOVIE-STYLE AMNESIA. Your FRIENDS and your intense loathing of that particular PIZZA PLACE. Hrm. 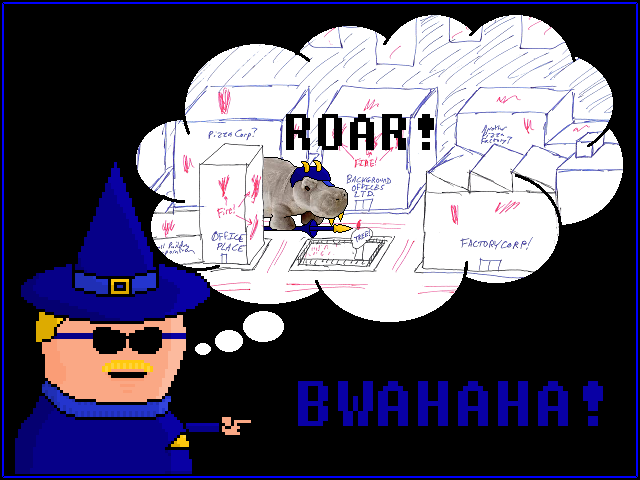 Well, I guess releasing your HIPPO upon those who have annoyed you can wait until you remember who they are. Until then, might as well release him upon those DEMON DUDES.